Summary: The Sarasota County Partnership for Lighting Improvement Project is a localized effort to address the safety concerns of private coastal interests, while furthering the goals of sea turtle conservation through a public-private partnership for lighting improvement. 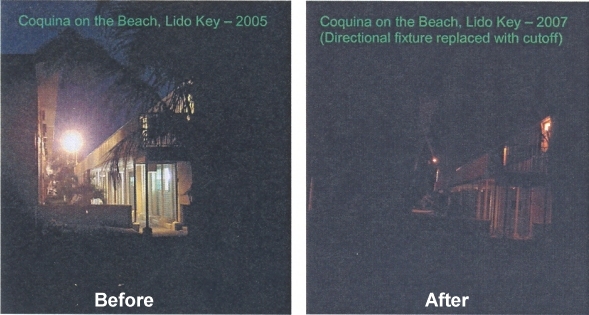 In an effort to minimize the effects of artificial lighting on sea turtles, Sarasota County has used both grant and allocated funds to retrofit publicly-owned/leased pole mounted, open-bottom, high-pressure sodium Florida Power & Light (FPL) fixtures with those more suitable for use near sea turtle nesting habitat (i.e., full cutoff FPL fixtures or alternative light sources such as low-pressure sodium or red LED light). This project will expand these efforts onto private and commercial coastal areas (condominiums, hotels, and resorts) located adjacent to important sea turtle nesting beaches by retrofitting up to fifty (50) open-bottom fixtures visible from the nesting beach. Such a public-private partnership would minimize the risk of impacts to sea turtles from artificial light while providing lighting necessary for the safety of residents and patrons in parking lots, driveways, and pedestrian areas. This project will allow coastal properties, their residents, and guests to experience how, through cooperation, sea turtles and humans can coexist for the benefit of both.